Here is your typical apple pie with a slight twist. It has cheddar cheese in the crust and what a nice twist it is! Combine flour & salt; cut in shortening until mixture resembles coarse crumbs. Sprinkle with water while mixing lightly with a fork; form into ball. Divide dough in half. Roll one part to 11" circle on lightly floured surface. Place in 9" pie plate. Combine sugar, flour, & cinnamon. Place mixture in pie shell; dot with margarine. Roll out remainder of dough to 11" circle; place over apples. Pinch and seal edges of crust & flute. Cut slits in top of pastry to allow steam to escape. Bake at 425 degree F, for 30-35 minutes. 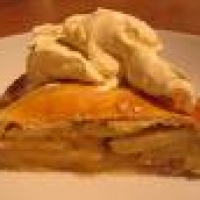 Yummmmm ~ I LOVE APPLE PIE and I LOVE THE IDEA OF PUTTING CHEDDAR CHEESE IN THE CRUST! Yum! Hubby likes to top his apple pie with cheese and melt it over the top...this is great!! Love this idea! My hubby STILL can't quite understand the mix of cheddar and apples, (where HE comes from they eat Haggis and Black Pudding - what can I say??!) but this Canadian sure does! Thanks for the post, Lor! Can't pass this one up. The combination of apples and cheddar cheese sounds decadent. Thanks for a great post.